1 : 190080 Walling, H. F.
190. Ontario, South. The World Atlas. 1 : 1330560 Colton, G.W. 1 : 1500000 Colton, G.W. Shell Highway Map of Michigan (southern portion). 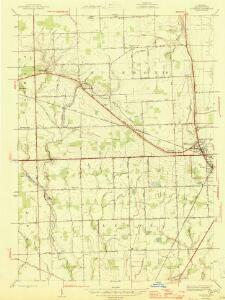 AutoTrails Map, Southern Peninsula of Michigan, Northern Indiana, Northwestern Ohio. 1 : 1314000 Hammond, C.S. 1 : 1400000 Colton, G.W.